Physical abuse of a child is when a parent or caregiver causes any non-accidental physical injury to a child. There are many signs of physical abuse. If you see any of the following signs, please get help right away. 28.3% of adults report being physically abused as a child. Sexual abuse occurs when an adult uses a child for sexual purposes or involves a child in sexual acts. It also includes when a child who is older or more powerful uses another child for sexual gratification or excitement. 20.7% of adults report being sexually abused as a child. Emotional abuse occurs when a parent or caregiver harms a child’s mental and social development, or causes severe emotional harm, it is considered emotional abuse. While a single incident may be abuse, most often emotional abuse is a pattern of behavior that causes damage over time.10.6% of adults report being emotionally abused as a child. In Minnesota, Each county and tribe in Minnesota has its own phone number for reporting child abuse and neglect. 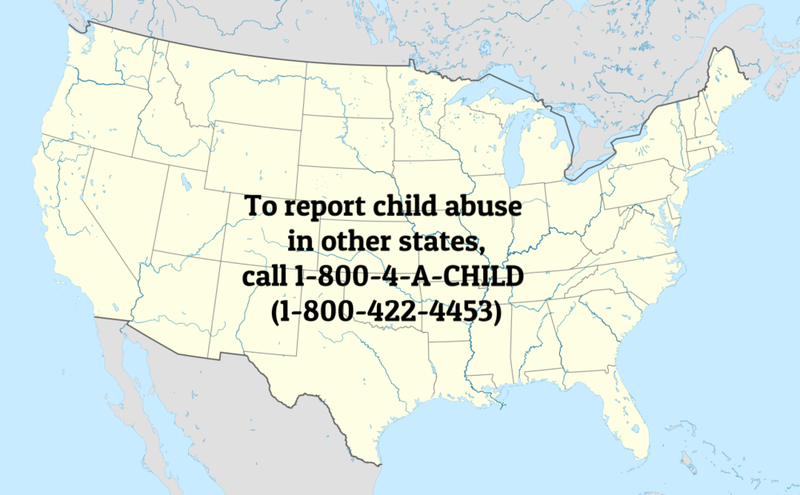 Go here to find the number for the county you are reporting the abuse in. The Childhelp National Child Abuse Hotline 1-800-4-A-CHILD (1-800-422-4453) is dedicated to the prevention of child abuse. Serving the United States, its territories, and Canada, the hotline is staffed 24 hours a day, 7 days a week with professional crisis counselors who, through interpreters, can provide assistance in over 170 languages. The hotline offers crisis intervention, information, literature, and referrals to thousands of emergency, social service, and support resources. All calls are confidential. Need help and want to talk to a counselor. Are in physical or emotional crisis and need support and encouragement. Need to be connected to the best possible resources in your area. Have questions about the signs of child abuse. Need to find out how to report known or suspected abuse. Have questions about the reporting process and what you might expect through the process. Want to learn about Childhelp programs that will address you or your child’s needs. Want to learn about resources available to parents, grandparents and caregivers. Need emotional support as a survivor of abuse. Want a referral to an agency, counseling or other services near where you live. Want information on how to make a donation to Childhelp. Childhelp crisis counselors cannot come to the home where the abuse is happening and take away the child or teen who is in danger of being hurt and put them in a new home. The Childhelp Hotline crisis counselors can’t make the child abuse report for you, but we are here to help you through it. Childhelp counselors can assist you by providing options based on the situation you describe. They cannot tell you what to do or guarantee that a specific outcome will occur.